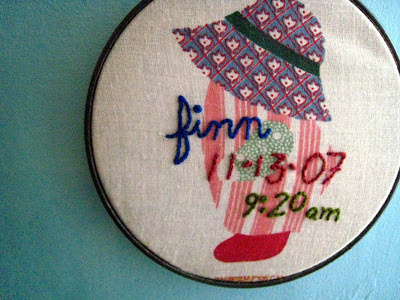 now in my shop, custom embroidery! 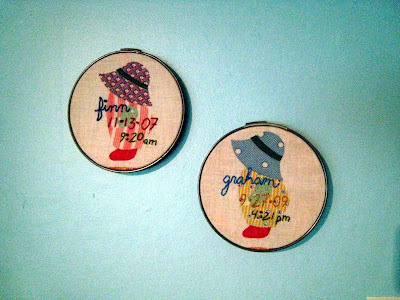 i loved doing the wedding pieces for my newly-married friends this year, and thought a birth announcement embroidery would be just as sweet! 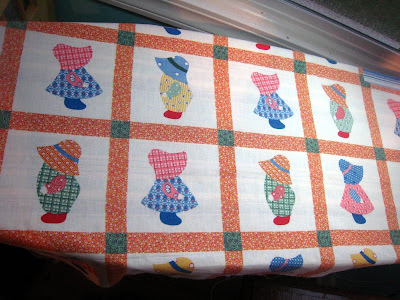 i can't remember where i happened upon this cute fabric -goodwill or estate sale, but the little boy and girl figures begged for it! plus, it gives one the very real excuse of needing all the details before finishing up that baby gift. i made this one shortly after our friends, the fortneys, welcomed graham into their lives. finn's birthday was not that long after, so i thought making matching birthday boys would be appropriate. the pictures were taken before i had secured the fabric around the edge with stitches. i am also so very pleased that all the materials are reclaimed, recycled, or, as they say, 'upcycled'. there are a limited supply of these available since the fabric is also rescued, but there are plenty of little boys and girls now. 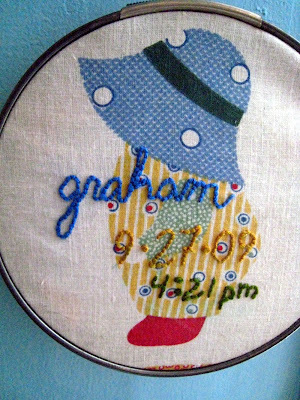 always, if you have an idea for a special birth embroidery or otherwise, don't hesitate to contact me at byhandathome (at) gmail.com. i especially love making things with the recipient in mind, so custom orders are a real pleasure for me. hope you enjoy these!